FLAGLER BEACH, Florida - The wind is out today in Florida, and that means my quest to see one of the most endangered whales in the world will be shifted a bit. 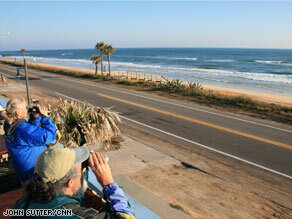 Patsy Sater and Paul Henderson watch for endangered right whales from a restaurant balcony in northern Florida. I had planned to venture into the Atlantic Ocean in an inflatable boat with scientists from the Florida Fish and Wildlife Conservation Commission to search for right whales. But the wind gusts are too strong, which makes boat trips like this risky and unproductive. It's difficult for the researchers to spot the whales in choppy waters. So I went to my plan B, which ended up being tons of fun: I traveled by foot and car up the Florida coast with a group of retirees who look for the school-bus-sized whales from the shore. Right whales are sometimes called “urban whales” because they live in waters so near the East Coast of the U.S. These volunteer whale watchers say the massive black whales sometimes come very near to the beach. Last Friday they spotted 11 of them at once - a group of juveniles playing. Armed with binoculars, they troll up and down the coast looking for blackish blobs of whale on the horizon. John Kostiak, 62, told me the whales look like black Sharpie marks on the blue ocean. When they spot a whale, they call in backup from scientists who then alert the shipping community to their presence. Collisions with ships are a major cause of right whale deaths, and these volunteers see themselves as a first line of defense. If they see a whale before a ship does, they could save a life. Only 400 of these whales exist, so each is critically important to the species' survival. The volunteers showed true dedication: One wore whale earrings and a whale necklace. Another goes out on these watches four days a week - spending four hours each day just looking for the behemoths. They all spoke of the intense joy they feel when they find a whale. That's relatively rare, though. One told me he's only called in two sightings in eight years. Like others, they hope their efforts contribute a small part to protecting a creature they’ve come to love. They also say they're raising whale awareness through their efforts. Many people - even in this part of north Florida - don't realize right whales give birth right off the coast here, well within eyesight. Each morning, the volunteers are doing their part to change that.